While Oliver Queen has dealt with a diverse lineup of villains on Arrow, few of them have had special abilities. There have been been exceptions like the Mirakuru-juiced Slade Wilson and the centuries-old Ra’s al Ghul, but his major adversaries have for the most part just been highly skilled humans. Fortunately for comic book fans, when Season 4 airs later this year, Oliver will get to fight another superpowered foe, and it will be a member of the Flash’s rogues gallery: Double Down. While Arrow’s Tell will use his tattoos to fight the Emerald Archer, his powers in the comics are much weirder. A notorious con artist, Tell lost all his money during an intense poker game. In a fit of rage, he killed the winner, but the mysterious man’s cursed deck of cards bonded to Tell and replaced most of his flesh. Although deformed, he could now mentally detach the mystical cards from his body and use them as razor-sharp weapons. 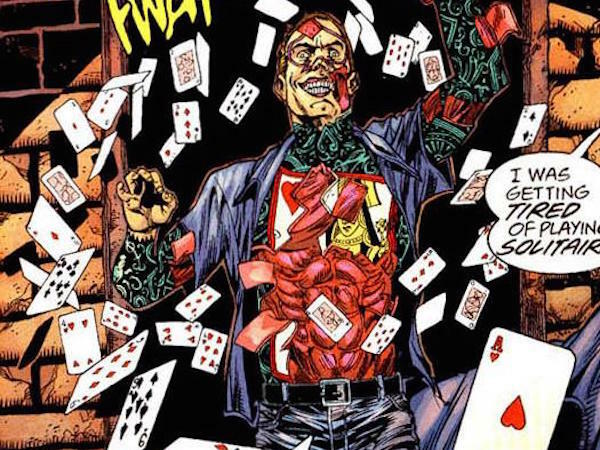 Although Arrow will be exploring magic in Season 4, the skin cards might have been a little too gory for The CW crowd, so that’s probably why they decided to go with tattoo cards reminiscent of the Green Lantern villain Tattooed Man. Weird powers aside, and assuming Tell isn’t killed in Arrow, perhaps we’ll seen him migrate to The Flash later in the season to fight Barry Allen either on his own or with some help from other Rogues. Bourne’s notable TV credits include recurring roles on Stargate SG-1 and Revenge. He also appeared on Teen Wolf, the same show that featured Colton Haynes, who played the recently departed Roy Harper. Bourne is the fourth villainous actor to be added to Arrow Season 4, following Neal McDonough’s Damien Darhk, Alexander Calvert’s Anarky and Jimmy Akingbola’s Baron Reiter. Other new characters this season include Echo Vellum as Curtis Holt, a.k.a. Mr. Terrific, and Jeri Ryan as Jessica Danfoth. Arrow Season 4 is scheduled to premiere on Wednesday, October 7 in its normal timeslot on The CW.